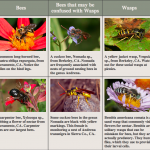 “Wasps and bees are often mistaken for each other, but knowing a few key features of both can help one tell them apart. 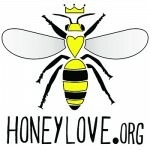 Bees gather pollen and nectar from flowers to use as food for their offspring. Wasps are carnivorous and hunt for other insects or spiders, but some also visit flowers for nectar. Bees usually have very hairy bodies and pollen collecting hairs on their legs or under their abdomen to help them accomplish this task. Wasps tend to have few to no hairs at all because they don’t intentionally collect pollen. …wasps usually have more elongate bodies, longer legs, and sometimes have what looks like a pinched waist, whereas bees usually look more compact. There are other physical differences between bees and wasps, but they are hard to make out without the use of a hand lens or microscope. So, if you see a busy creature flying from flower to flower and actively collecting brightly colored pollen, then you can be fairly sure it is a bee. Bees actually evolved from predatory wasps (apoid wasps), so bees and wasps have a lot of similarities both in appearance and behavior. 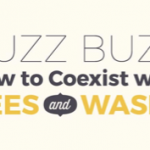 Bees and wasps both have two sets of wings, unlike flies, which only have one. Also, only the females of bees and wasps can sting because the stinger is actually a modified egg laying apparatus. Behaviorally they are similar in that they both have social and solitary species. Yellow jackets, like bumble bees, have seasonal colonies that form in the spring and die out in the late fall with the queens overwintering to start a new colony the following year. The majority of bees and wasps though are solitary, and the female does all the work of building and provisioning nests for her young.